Brand new from Music Minus One! 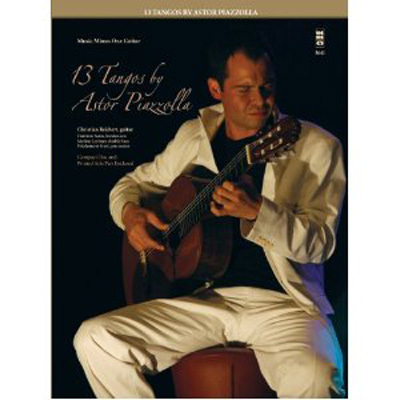 This edition features thirteen tangos by the groundbreaking composer Astor Piazzolla (Play Piazzola, 13 Tangos by Astor Piazzolla by Gary Ryan, Boosey&Hawkes edition). These brilliant works showcase Piazzolla's tango nuevo form, a fusion of traditional Argentinian tango with Western musical elements and jazz harmonies for which he continues to be celebrated around the world. The accessible guitar arrangements are by Gary Ryan, international performing artist and professor at the Royal College of Music in London. They are performed by the sensational Christian Reichert and his ensemble, including Hartmut Saam on bandoneon, Markus Lechner on double bass, and Friedemann Stert on percussion. Listen to Reichert's thrilling performances, then take center stage for your own tango extravaganza. Includes the guitar score only.